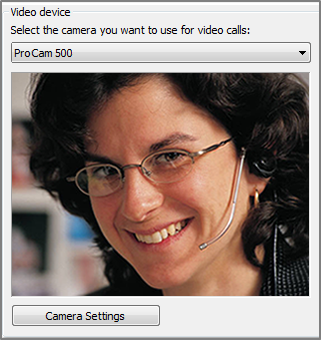 For the best results during a Skype for Business (Lync) video call, set up and test your camera before you use it. You need a camera to make a video call or share your video in a meeting, but you don’t need one to receive a video call or see other people’s videos. In the Skype for Business (Lync) main window, go to Options > Video Device. You’ll see your video in the window. If you have more than one camera and want to switch, select it from the drop-down list. For advanced settings such as color balance, contrast, brightness, and black-and-white mode, click the Camera Settings button. Make sure the camera is connected and follow the instructions that came with the device to install it. Check if another program on your computer is using the camera. If so, close that program and try again. If you have a built-in camera, but Skype for Business (Lync) doesn’t detect it, check to make sure it’s not disabled on your computer. Contact your technical support for help, or go to Windows Device Manager to check the status of the camera. Click Start, and type Device Manager in the Search programs and files. Click Device Manager on the search result. Under Imaging Devices, right click Integrated Camera and click Enable. Important: Your computer settings might be different from what’s shown above. Contact your technical support if you’re not sure how to enable your camera. How do I know I’m sharing video? 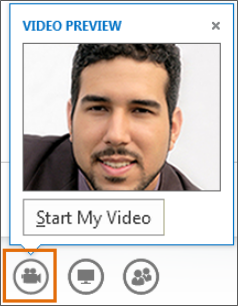 When you make a video call, Skype for Business (Lync) automatically displays your video in the window. But when you join a Skype for Business (Lync) Meeting, you don’t automatically share video. You’ll need to point to the camera icon and click Start My Video. When you’re not displaying video, the camera icon is grayed out. When you’re displaying your video, the camera icon lights up. When you pause displaying your video, you’ll see a red diagonal line across the camera icon.